We were getting ready to put together the engine controls on the Triumph TR250 we have been restoring. Initially we sprayed the upper section of the accelerator-to-carburetor linkage with Eastwood's zinc-rich paint, but it looked more like light gray primer than bare metal. With the rest of the engine looking spiffy, we wanted the linkage to have a nice bare metal look with rust protection. 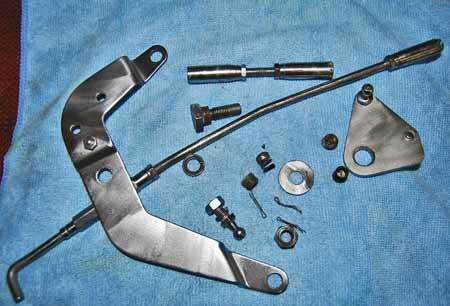 Photo 1: the parts from the upper section of the Triumph TR250 accelerator linkage. The long rod has been blasted and wire wheeled. The other parts have been painted with Eastwood's rust-fighting galvanized paint. The parts of this linkage that we will be talking about in this article are parts 30-45 in the accompanying catalog illustration (Photo No. 2). In three cases two or even three of these parts are required. We also removed three tiny internal parts and one cotter pin (four parts in all) from each of the three rod ends to clean up the socket joints. These parts aren't shown separately in the catalog. Photo 2: catalog illustration showing the parts to the complete linkage. This article cover the upper section (parts 35-40). There are over 45 parts if every nut and bolt in the assembly is removed. Note that spring No. 31 is missing. This adds up to a total of 32 parts that we are dealing with in just the upper section of the linkage. All these parts are listed below. Most are numbered to match the illustration. Parts not sold separately are not in the illustration. 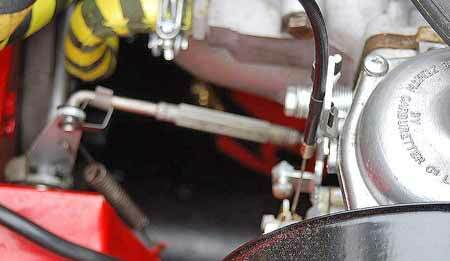 At this point we'd like to suggest that most car owners probably have no idea that this type of linkage is so complicated or that purchasing all 32 parts (new, reproduction, used or fabricated) could cost around $400. This is a good example of why auto restoration is a long, tedious and expensive process. We started by photographing both sides of the assembly from various angles (Photo 3 shows the opposite side) so we'd know how to orient the parts for re-assembly. Disassembly of the three rod ends comes first. You can see all three of these in Photos Nos. 1. One that has already been blasted and polished up is at the right-hand end of the long rod. The two other rod ends are screwed onto a short rod at either end of the rod. (These stick up highest in both photos). Photo 3: We started by photographing both sides of the assembly from various angles. Compared to Photo 1, this photo shows the opposite side. The photos were taken so we'd know how to orient the parts for re-assembly. The rod ends (No. 43 in the illustration for example) are actually small barrel-shaped sockets that fit over balls (or ball joints) attached to the bell crank lever (No. 34 in the illustration). Small slotted end plugs that screw into the "barrels" and squeeze the ball joint between the slotted end plugs hold these together with what we call the end plug socket spacers. Small springs also fit over the spacers. When the slotted end plug is screwed in just right, the ball joint (which enters the barrel through the opening in its side) will be held in place. Then, tiny cotter pins are lined up with the slot in the end plug, passed through two of the small holes in the top of the barrel and spread into holding position. To remove the ball joints you must remove the cotter pins, back out the slotted plug, pull the ball joint out of the side opening, and tap the barrel on the work bench so that the spacers and springs drop out. If there is corrosion inside the barrel (such as on our car) you may need to use dental picks to remove the spacers and springs. The very small coil springs fit over the lip on each tiny spacer. All these parts are very small and easy to drop and loose, so be careful. Photo 4: The two rod ends have opening in the side were the ball sockets fit in and get held in place by plugs, spacers and springs. Here the holes are opposite each other. Note the small holes at the top of the barrel for the tiny cotter pins. Once the ball sockets and rod ends are removed you are left with the bell crank lever and the support bracket which are held together by a shouldered bolt with a nut and washer on the support bracket side (Photo 5). 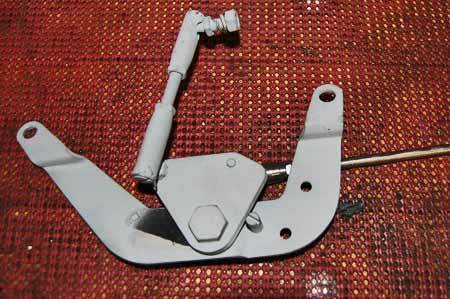 Two of the ball joints are also attached to opposite sides of the bell crank lever. These balls could be removed, but there is no real reason to do so. Photo 5: With ball sockets and rod ends removed you're left with the bell crank lever and support bracket held together by a shouldered bolt. Two of the ball joints are also attached to opposite sides of the bell crank lever. 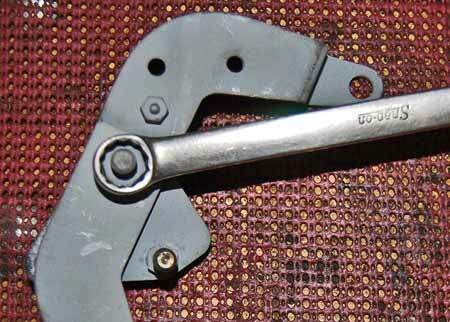 A 1/2-inch box end wrench can be used to remove the nut holding the shouldered bolt in place (Photos No. 6 and No. 7). 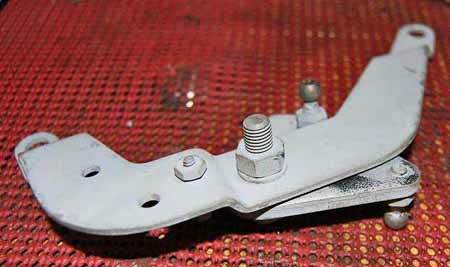 Then, separate the bell crank lever from the support bracket. Note the support bracket is a part that isn't available in reproduction form. The spring (No. 31 in the illustration) that fits over the control rod assembly (No. 30 in the illustration) is also unavailable. 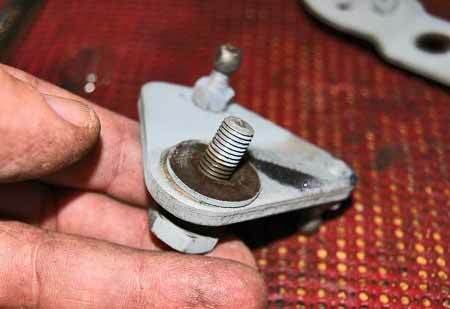 Our spring was missing and it is an important part that helps the accelerator pedal return. Photo 6: Box end wrench can be used to remove the nut holding the shouldered bolt in place. 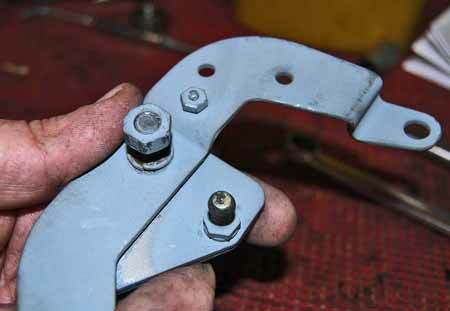 Then, separate the bell crank lever from the support bracket. Note the support bracket is a part that isn't available in reproduction form. 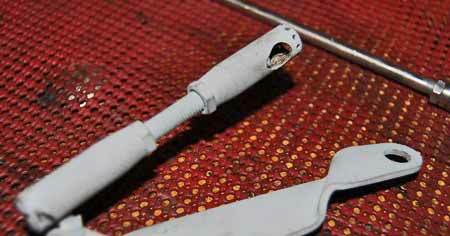 Photo 7: Remove the large bolt from the shouldered bolt. The small nuts holding the ball joint balls to the bell crank lever do not have to be removed to clean the pieces up so we just left them in place and taped the balls when we blasted. The shouldered bolt has a fairly thick thrust washer/spacer between the bell crank lever and the support bracket (Photo No. 8). Do not lose this because it is not just an ordinary washer. It has specific dimensions for its job. Photo 8: The shouldered bolt has a fairly thick thrust washer/spacer between the bell crank lever and the support bracket. Do not lose this because it is not just an ordinary washer. It has specific dimensions for its job. At this point no further disassembly was required to move to the next phase beautifying the car's linkage. The larger parts went into the media blasting cabinet to be glass bead blasted. We covered the ball joints up so their surfaces wouldn't get roughed up. Blasting left the parts with a clean, silvery appearance. They looked very nice, but not like the linkage we saw on one car (Photo No. 9) at the Vintage Triumph Register convention in Lake Geneva, Wis.
Photo 9: This photo shows the upper part of the linkage on a TR250 show car at the Vintage Triumph Register convention. 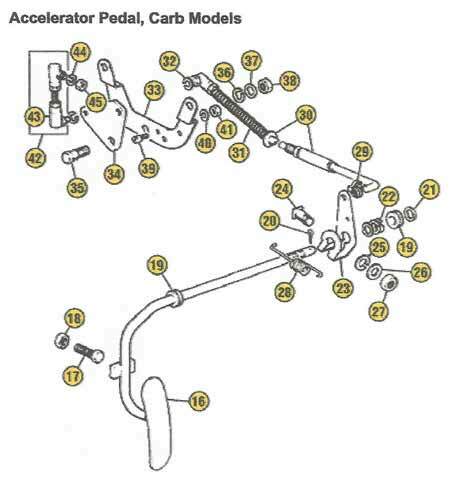 The lower part of the linkage has more pieces and connects the upper carb linkage section to the accelerator pedal. Our next step was burnishing the bead blasted parts on the wire wheel. Wear heavy gloves and eye protection and be careful. Parts can get snagged in a wire wheel and go flying halfway across a room. Small parts can literally "disappear before your very eyes." Larger parts can become shrapnel. But if you go carefully, take your time and follow standard safety procedures, wire brushing can make the parts look nearly new (Photo 10). After the parts have the proper "bare metal look" you can clear coat them to protect them from rust. Another option is coating them with RPM (Rust Prevention Magic), a product that can be applied with a brush after it is heated. Visit www.ecs-rpm.com for more info. Photo 10: This image shows most of the parts involved in the assembly after they had been glass bead blasted, polished on the wire wheel and clearcoated for rust protection.